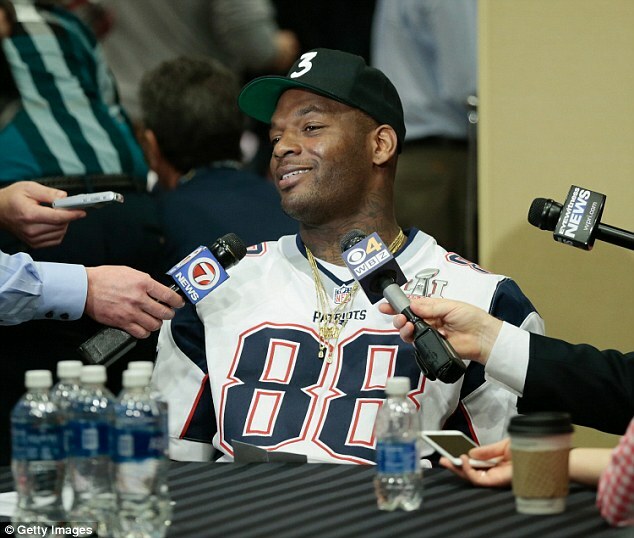 Martellus Bennett is the Marshawn Lynch of this Super Bowl. Both are engaging, creative characters who capture the imagination of the cliche-fed press. 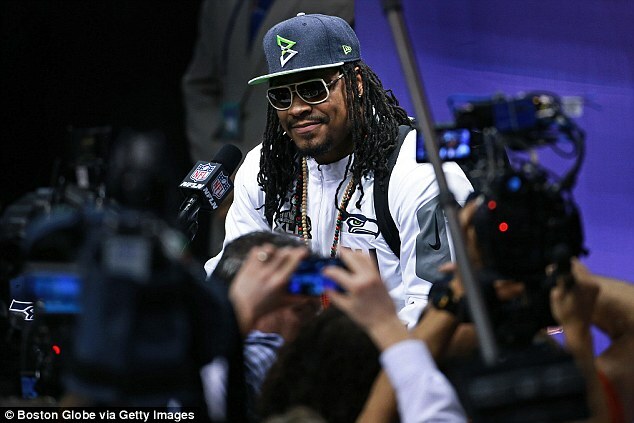 Yet while former Seattle Seahawks running back Lynch refused to talk to media two years ago, Bennett is one of the few players in Houston who is confident and comfortable enough to discuss, well, anything. Bennett is not your conventional NFL player. He played the trombone, trumpet and clarinet at high school and lists Dr Seuss and Harry Potter among his heroes. When he isn’t spending time with his wife Siggi and two-year-old daughter Jett, he publishes children’s books through his company, The Imagination Agency. ‘I just wanted to make things and tell stories, so whether it’s films, cartoons, apps, books, I just like to make stuff. I have all these stories that need to be told,’ he explained. Bennett, 29, walks around with a notebook to write down the constant stream of ideas that come into his head. But it doesn’t always go to plan. ‘I grabbed the wrong notebook this morning and I’m starting to realize how much I hate paper with lines. It feels like my words are walking,’ he tweeted last month. 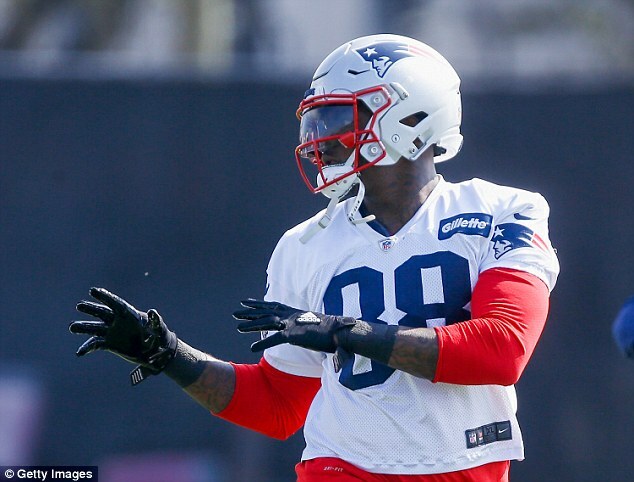 The Patriots became Bennett’s fourth team in nine seasons when they gave the Chicago Bears a draft pick last spring. It seemed an interesting fit. On the field, he would give the offense another dimension, forming a brutal partnership with Rob Gronkowski. It didn’t quite work out like that, with Gronkowski hampered by a back injury that would curtail his season in November. ‘It’s like when Batman got his own solo movie and Robin wasn’t in it. I always liked the movies with Batman and Robin in it,’ was Bennett’s take on the matter. But despite playing with a cracked bone in his ankle, Bennett had a decent year, scoring a career-high seven touchdowns and 701 yards from 55 receptions. But what about off the field? How does someone so, well, interesting fit in with the monotony and control of the success-driven Bill Belichick regime? ‘They invested in me not only as a player but as a person and that’s hard to find in places, because a lot of coaches don’t have the self-assurance and self-awareness to let guys be who they are,’ he said. ‘No one ever really said anything to me. One of the reasons I’ve had success here is because they just let me be me. The only thing they worried about was me as a player, not me as a person. After finishing high school he declared for the NBA draft, but retracted that when he was told that he would not be a first-round draft pick. So he followed his best friend and older brother Michael (he won the Super Bowl with Seattle three years ago) to college at Texas A&M. His height and hands, speed and strength made him a prototypical tight end. Bennett, known as Marty to his friends, lasted four seasons with the Cowboys after being drafted in the second round in 2008. Jason Witten, who completed his 163rd consecutive start as the Cowboys lost to Green Bay in the playoffs, proved an immovable object. ‘I hated Jason Witten. 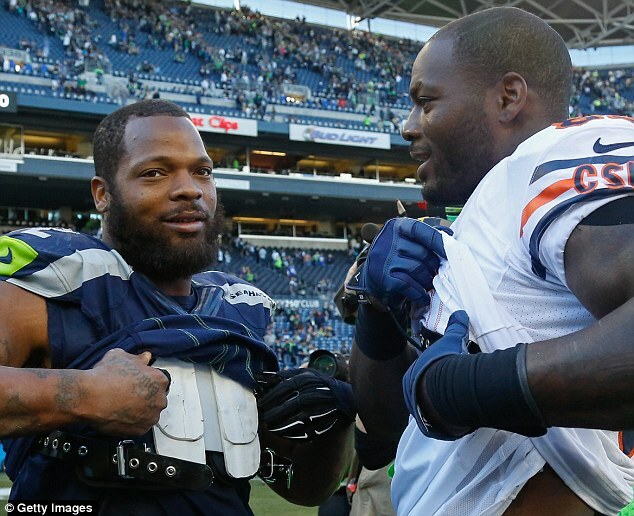 I appreciated his game, but I always hated him,’ Bennett said. So Bennett moved to the New York Giants for a year before heading to a middling Chicago on a lucrative deal. 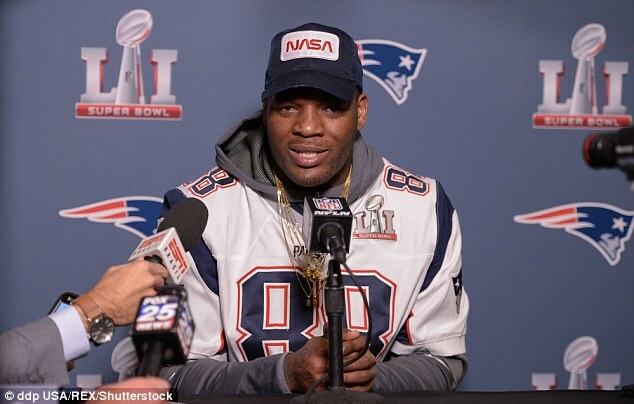 That was evident after the Patriots sealed their spot in the Super Bowl – Bennett’s first – after cruising past the Pittsburgh Steelers in the AFC Championship game. 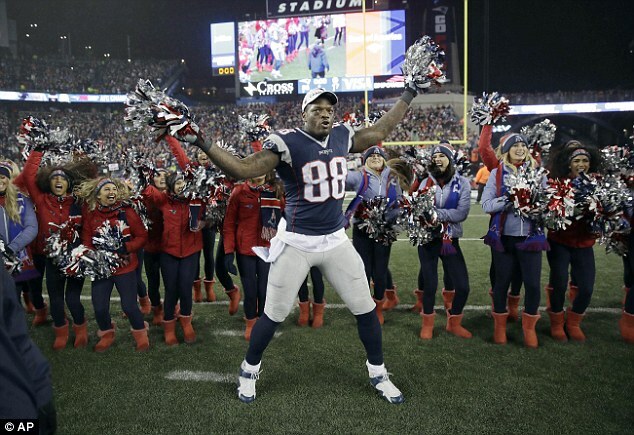 Playful as ever, Bennett grabbed some pom-poms and danced with some Patriots cheerleaders. His wife cried as their daughter laid down alongside a beaming Bennett on the Foxborough field, making snow angels in the red and blue confetti. And if Bennett helps New England to a fifth Super Bowl, you can bet he’ll be at the centre of the celebrations – and the attention – once again.